A friend of mine celebrated her birthday and I could not decide on what to give to her as a birthday present. She seemed to have everything. Then the idea to make a donation to charity on her behalf came to mind. I thought she will be happy knowing that she is making a difference and on her birthday. So I did exactly what I was thinking. I searched for the right charity group and made a donation under her name. I got so excited with the result of the donation especially because the tax deduction receipt was issued under her name. I did not know how to tell her or how to give her the tax receipt document so I bought a birthday card and inserted the tax deduction receipt. I wrote a message that she was making a difference on her birthday as my birthday present and mailed the card. Two days after she sent me a message letting me know she received my birthday card and was the best present she has ever received on her birthday. This then gave me an idea of a greeting card. 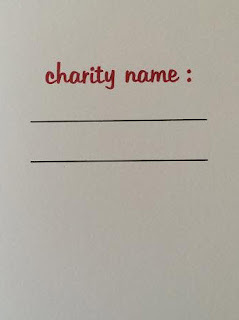 A donation for charity greeting card which can be used for birthdays, wedding presents, christmas and even as anniversary presents. ​1) make the actual donation to any charity of your choice. ​2) Once you have made payment and/or your donation has been processed, print the tax deduction receipt. 4) then insert the tax receipt document. ​5) You can also write a personal message on the blank space on the left side of the inside panel. You probably will not find this card anywhere. Size of the card is standard card size of 110mm x 155mm and comes with a matching white envelope for easy gift-giving. 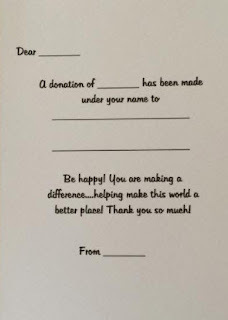 Why not help someone make a difference by making a donation on their behalf and use this card to let them know about it. It sells for $2.00 per card. To check out this unique handmade greeting card and make a purchase, all you have to do is click on the image above or click on the link below - Thank you.